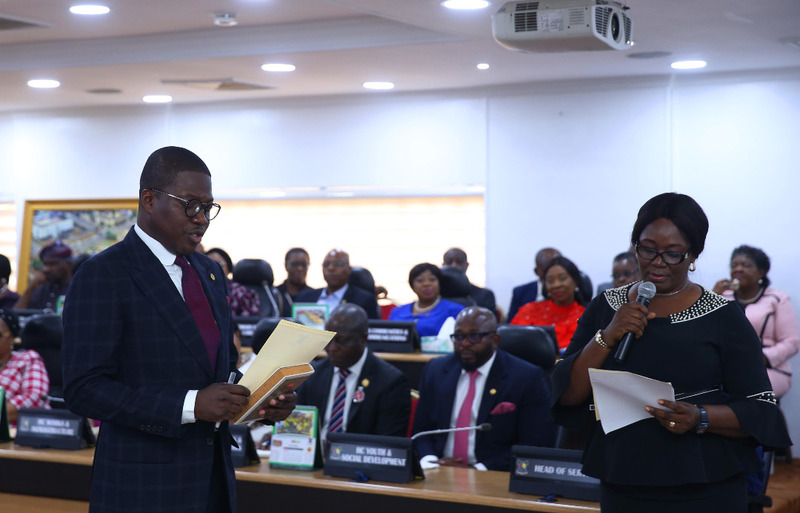 Following the swearing in of the new Head of Service, a new chapter has just been opened in the history of the Lagos State Public Service. It is a new chapter with high expectations for the injection of new energy and vibrancy that will move our Public Service to new heights. I congratulate the 21st Head of Service, Mr. Hakeem Muri-Okunola and welcome you on board. Let me also use this opportunity to restate our appreciation and gratitude to the immediate past Head of Service, Mrs. Folashade Sidikat Adesoye for her meritorious service to the government and people of Lagos State and for her work in strengthening our Public Service. We wish her a happy life in retirement. The Civil Service, as an institution, plays very important role in governance. Indeed, the extent to which any government succeeds in the implementation of its policies and programmes largely depends on the quality and orientation of the Civil Service; not only in terms of its structure, processes and procedures, but also the commitment and quality of its leadership at all levels. Our Civil service needs a leadership that will inspire confidence and the will to strive for excellence. We are in a technology age where creative thinking and innovation must be given a pride of place through the growth mindset initiative, the Service Charter and others policies being driven by the Office of Transformation, Creativity and Innovation. I am satisfied with the positive impact these initiatives have made so far to the extent that the Lagos State Public Service is gaining the confidence and trust of the citizens especially taxpayers. It will however take consistent implementation and improvement of these initiatives for us to achieve the ultimate goal of making our Public Service truly service-oriented and responsive to the demands of Lagosians. These are the challenges before our new Head of Service who I believe strongly has the capacity, knowledge, exposure, experience and youthful energy to handle these effectively. As the number one Civil Servant in Lagos State, you must demonstrate leadership and lead by example for others, including the Body of Permanent Secretaries, to follow. You have a responsibility to provide direction and encourage accountability, transparency, professionalism and high sense of discipline. Your actions must be based on sound and objective judgement with consideration for merit and proven record of competence and loyalty. 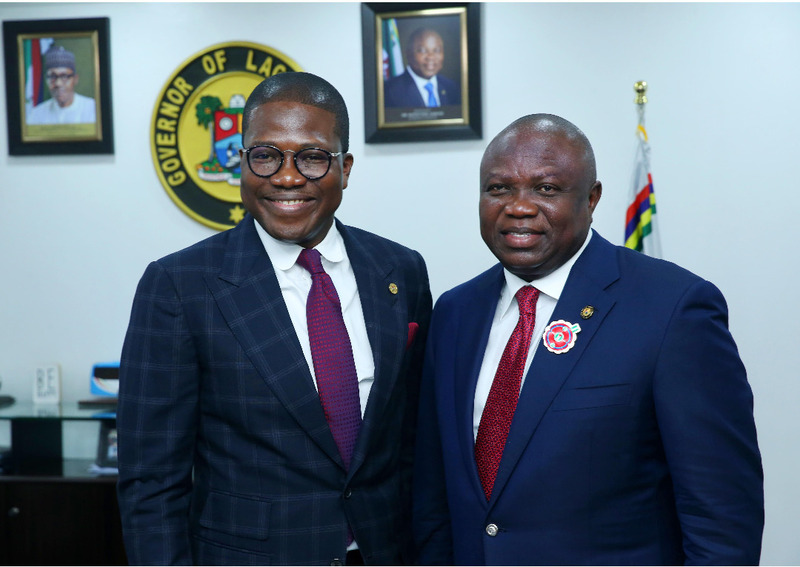 I have no doubt in my mind that under your leadership, Lagos State Public Service will achieve great strides and record outstanding achievements as a role model for other public service institutions in Africa. I assure you of my support in your new assignment as we work to make our State a globally recognized City-State with a commitment to efficiency, effectiveness, innovation and creativity in service delivery. Once again, I congratulate Mr. Hakeem Muri-Okunola on this appointment and in the spirit of the season, I wish you all a prosperous 2019. I congratulate our newly appointed Permanent Secretaries who have just taken the oath of office. This is no doubt, a happy and fulfilling moment for all of you, your families, friends and colleagues who have contributed in various ways to your successful career in the Lagos State Public Service. You have been appointed among several of your colleagues who are also eminently qualified to fill the vacancies created by the exit of some Permanent Secretaries. Your appointments were strictly based on merit as evidenced by your outstanding performance, commitment and dedication to duty over the years. With this appointment, you have all effectively become the Accounting Officer of your MDAs. You have been entrusted with a bigger and more sensitive responsibility which will put to test your leadership and managerial skills. Let me remind you of the very high expectations that will be placed on you, not only from the government but more importantly, from the over 22 million Lagosians who desire efficient and service delivery. Your ability to meet these expectations will depend on the amount of creativity and innovation you can bring to bear in the discharge of your responsibilities. Nobody expects you to reinvent the wheel. What is expected of you is to bring to bear your knowledge and experience so that the machinery of governance can roll faster and deliver more quality results to the teeming population of our State. Given your very impressive track records, I am very optimistic that you will rise up to the challenge and justify your new appointments. I congratulate you all and wish you success in your new assignment. Itesiwaju Ipinle Eko lo je wa logun. Lagos State Governor, Mr. Akinwunmi Ambode (left), acknowledging cheers from residents at the 3rd Quarter 2018 Town Hall meeting (12th in the Series), held at Community Primary School, Iberekodo, Ibeju-Lekki, on Wednesday, July 25, 2018. With him is the Deputy Governor, Dr. (Mrs) Oluranti Adebule (right). “But we all must know that Apapa crisis is more than traffic issues. That is where all States depend on for revenue through Customs because the revenue is shared at FAAC. If anything goes wrong in the Port, whatever they get from Federal Allocation Account Committee (FAAC) could reduce,” Governor Ambode said. 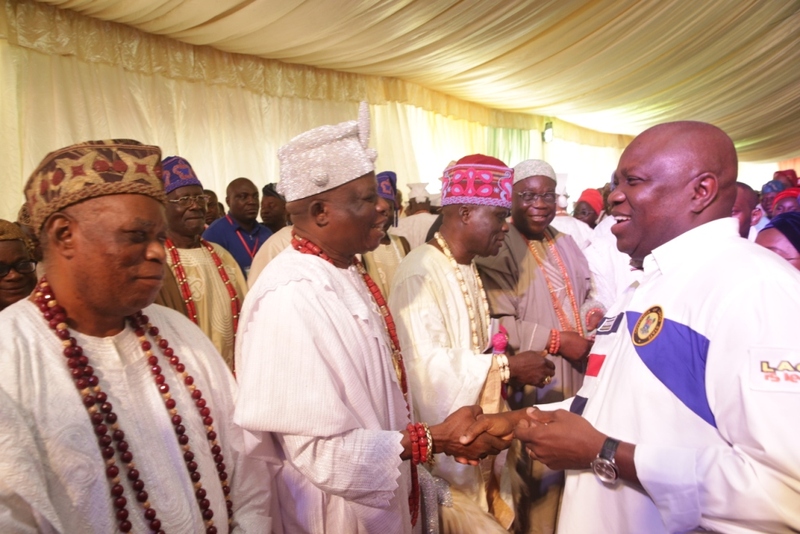 Lagos State Governor, Mr. Akinwunmi Ambode (right), with Oloja of Epe, Oba Kamorudeen Animashaun (left);onitedo Oke Odo Iwerekun, Oba Tajudeen Elemoro (2nd left); Onibeju of Ibeju, Oba Rafiu Salami (3rd left) and Ojomu of Ajiranland, Oba Adetunji Akinloye (2nd right) during the 3rd Quarter 2018 Town Hall meeting (12th in the Series), at the Community Primary School, Iberekodo, Ibeju-Lekki, on Wednesday, July 25, 2018. Lagos State Governor, Mr. Akinwunmi Ambode, addressing residents, traditional rulers, party chieftains and other dignitaries while Deputy Governor, Dr. (Mrs) Oluranti Adebule (right) and members of the State Executive Council watch with admiration during the 3rd Quarter 2018 Town Hall meeting (12th in the Series) at Community Primary School, Iberekodo, Ibeju-Lekki, on Wednesday, July 25, 2018. Lagos State Governor, Mr. Akinwunmi Ambode; Commissioner for Information & Strategy, Mr. Kehinde Bamigbetan; Senator Gbenga Ashafa; Deputy Speaker, Lagos State House of Assembly, Hon. Wasiu Eshinlokun Sanni and Party Chietain, Dr. Tola Kasali during the 3rd Quarter 2018 Town Hall meeting (12th in the Series), at the Community Primary School, Iberekodo, Ibeju-Lekki, on Wednesday, July 25, 2018. 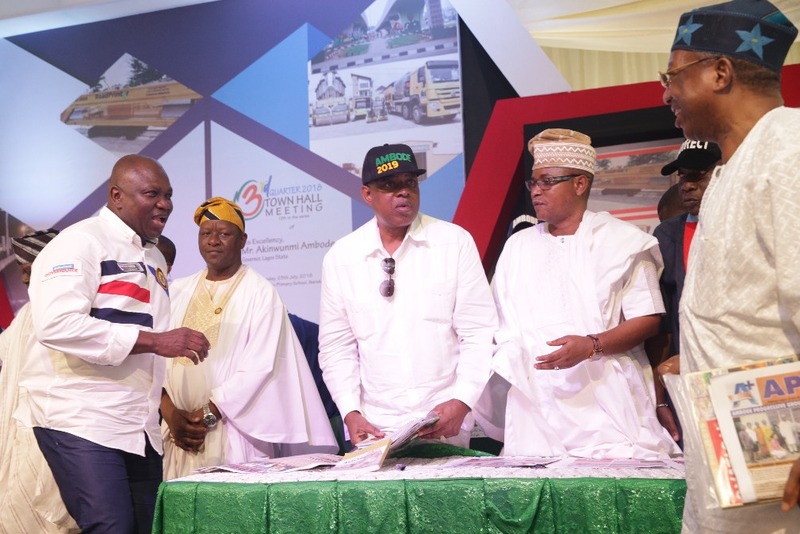 The Governor, while thanking traditional rulers, community heads and residents of Ibeju Lekki for their unflinching support towards the advancement of the multibillion dollar projects ongoing in the Lekki Free Trade Zone assured that all issues relating to compensation would be resolved before the end of the week. 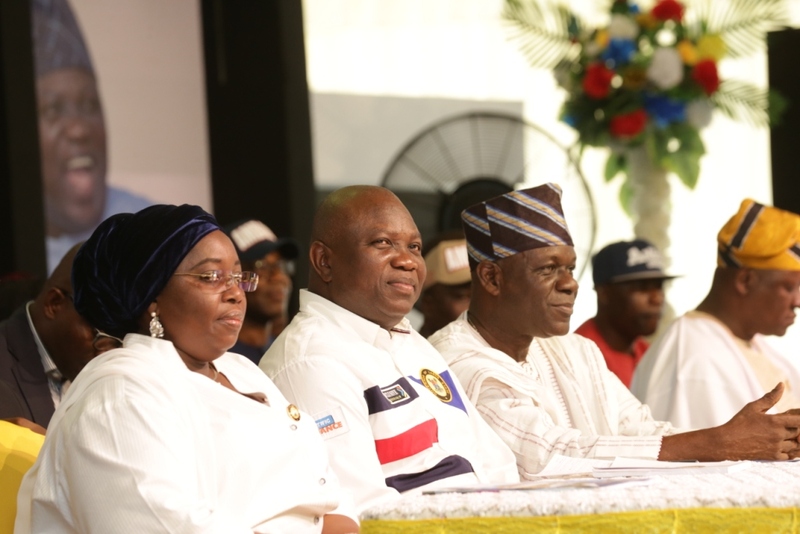 Lagos State Governor, Mr. Akinwunmi Ambode (middle); Deputy Governor, Dr. (Mrs) Oluranti Adebule (left) and State Chairman, All Progressives Congress (APC) Lagos, Alhaji Tunde Balogun (right) during the 3rd Quarter 2018 Town Hall meeting (12th in the Series), at the Community Primary School, Iberekodo, Ibeju-Lekki, on Wednesday, July 25, 2018. 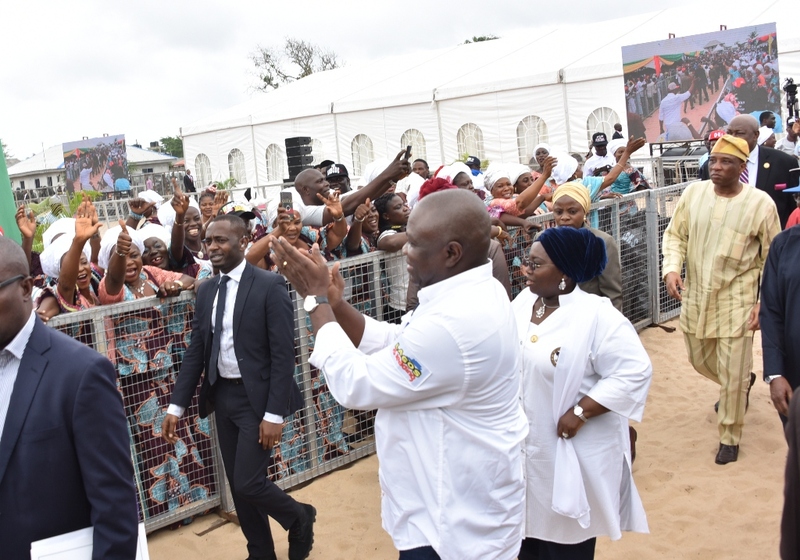 Taking questions from residents, Governor Ambode said his administration would go back to the drawing board and respond accordingly to issues raised, appealing to residents to be patient as the Government would continue to deliver more life changing projects to make life more comfortable for the people. 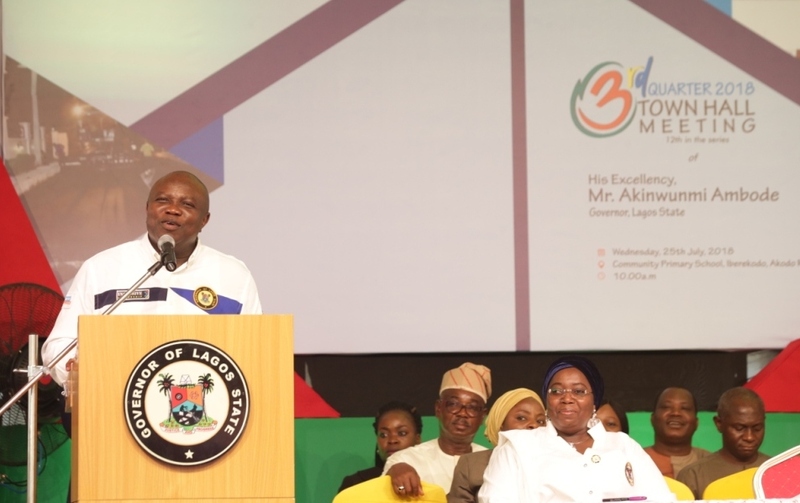 Lagos State Governor, Mr. Akinwunmi Ambode on Monday evening urged civil servants in the State to continue to give their best to raise the bar of excellence which the State Public Service is known for, saying such was important to keep the State working efficiently. Speaking at a special dinner to honour outstanding public servants in the State held at Lagos House, Alausa, Ikeja, Governor Ambode said Lagos was working because of dedicated and diligent public servants who, according to him, are daily working to make life comfortable for residents and investors. “The Lagos State Public Service has set a standard which others are trying to emulate. We have put in place a reward system that will encourage healthy competition/rivalry among public servants. We believe strongly that this is one of the ways employees can be motivated to put in their best at all times. “As we celebrate our public servants, there is still a lot of work to be done. We have set a standard for others. We must not only maintain that standard but raise it another notch,” he said. He commended the commitment of the workforce across the Ministries, Departments and Agencies and also the 20 Local Governments and 37 Local Council Development Areas (LCDAs), assuring them that his administration would continue to provide a conducive environment for them to perform their duties optimally. “We have gathered here this evening to, in a small way, thank and recognize our public servants, the unsung heroes in our State’s growth and development. I am privileged to have been on both sides of the divide and so I understand the life of a public servant. 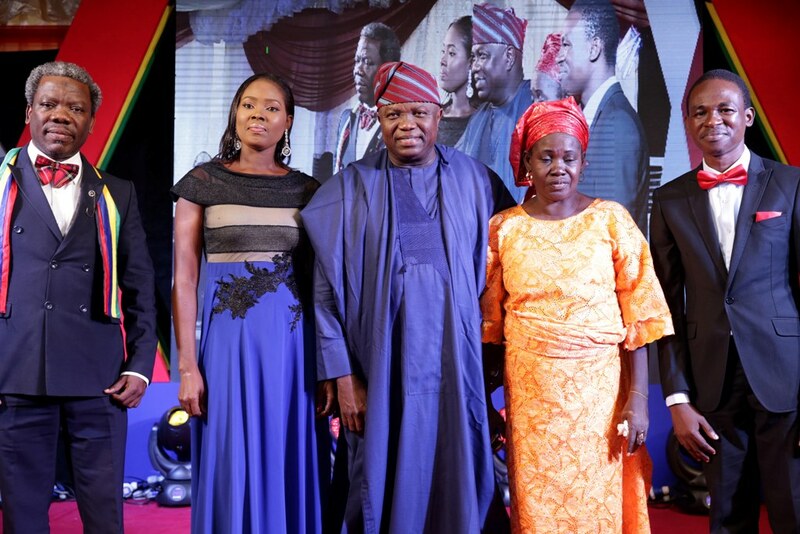 Lagos State Governor, Mr. Akinwunmi Ambode (middle), with some of the outstanding Public Servants, Mrs. Abosede Fasaye in Ministry of Justice (2nd left); Mr. Adesina Sogo Osikoya from Egbe Idimu Local Council Development Area (left); Mrs. Taiwo Iyabo Oguntola from Civil Service Commission (2nd right) and Mr. Tolulope Joseph Odusanya from Education District I (right) during a special dinner in honour of outstanding Public Servants in the State at Lagos House, Alausa, Ikeja, on Monday, June 25, 2018. “When we say Lagos is working, it is because of the dedicated and diligent public servants in our State. It is because of that Medical Doctor in the General Hospital in Agege; it is because of the LASTMA official on the road in Igando and it is because of the Admin officer here in a Ministry in Alausa. “Our State is working because the Police Force, the Army, the Navy and the Airforce are working together to ensure our security and give investors confidence to do business in our State,” Governor Ambode said. He said though the life of a public servant was that of selfless service, self-sacrifice, diligence, hard work and thankless work, but that however thankless the job is, it must be done and done very well, just as he specifically charged public servants to keep Lagos working. While congratulating the 90 recipients of the outstanding officers’ award who emerged both from senior and junior categories, the Governor admonished them to see the development as a challenge to maintain and improve on the high standard which qualified them for the recognition. “This recognition is a challenge for you to maintain and improve on the high standard for which you are being recognized. The State is in need of more high flyers like you to accelerate the delivery of quality service in all sectors for the benefit of all residents of our State. “As government, we will always work to ensure a conducive work environment, provide state of the art facilities and exposure of our people to best practices through training and retraining,” Governor Ambode said. In addition to the plaques and certificates given to the outstanding officers, the Governor directed the Head of Service, Mrs Folasade Adesoye to come up with recommendation on financial reward for the officers, while a framework would be put in place to institutionalize it based on ratification by the State Executive Council. Besides, Governor Ambode said as part of the reward system for civil servants, arrangements were being firmed up to transform the former Car Park in Alausa to Public Service Plaza to be managed by the Civil Service Club, adding that facilities to be enjoyed at the plaza would include Swimming Pool, Lawn Tennis Court, Five-aside Football Field, Gym, Daycare Centre, Library, Corporative Club to sell things cheaply for civil servants and Cafeteria, among others. In her opening remarks, Adesoye said the award dinner was a befitting grand finale to the week-long 2018 Public Service Day Celebration, an annual event being celebrated since 1994 following a resolution by the Conference of African Ministers of the Civil Service, to appreciate the contributions of public servants to governance, public service delivery and humanity. 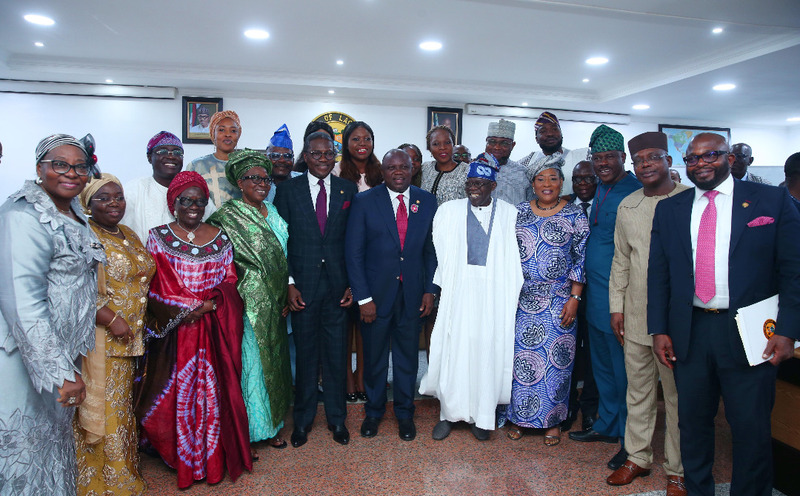 She lauded Governor Ambode for the various initiatives to support and appreciate civil servants in the State, expressing optimism that the recognition of outstanding officers would spur others to continue to put in their best knowing that their contributions would not go unrewarded.